A friend once told me he thought the difference between Mother's Day and Father's Day was that on Mother's Day, everyone celebrates how wonderful she is, but on Father's Day, everyone talks about how he could do better. Think about it - mothers get chocolate and perfume and candles - things to relax and enjoy a break. Fathers get ties (clean yourself up! ), lawnmowers (cut the grass! ), and BBQs (cook some dinner!). Fathers often get short-changed in movies, too, but this week I'm celebrating one of my favorite fathers in recent film: Steve Carell in Dan in Real Life. When I mention my love for this movie to people who haven't seen it, they invariably tell me, "Oh, I'm not really into Steve Carell's kind of humor." I have to assure them this is unlike most Steve Carell movies out there. It's funny, yes (the scene where he calls the corn on his fork an "angel" makes me laugh out loud every time! ), but it's also honest and heartfelt, and truly moving. 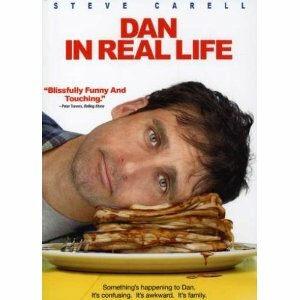 Carell's Dan is an advice columnist and widowed father of three girls trying to balance home life, family, and career. He earnestly tries to do right by his daughters, providing affection and discipline (much to his daughters' dismay) in equal measure. There's typical fatherly anxiety over one daughter's romantic interest in an older boy (his attempts to keep them apart bring his daughter to scream "You are a murderer of love!" - another unexpectedly funny scene), and hesitation at letting his oldest gain her freedom through driving. He also, like many fathers do, is struggling to recognize that his baby girl is growing up and needs his emotional support. A long weekend family reunion brings Dan and his daughters into the warmth and concern of his loved ones, and we see him gradually begin to admit how lonely and lost he is. A chance encounter with a new woman also begins to open his wounded heart, though he quickly discovers complications in getting to know her any better. I find Dan in Real Life exquisite in just about every way: the acting, the pace, the mood, the honesty. It shows everything that is fragile and touching about fatherhood, and ultimately celebrates the strength a father has in loving and guiding his children. Motherly advice: The PG-13 rating is for sexual innuendo, and there are just a few slightly awkward scenes, but nothing outright or in-your-face. I would recommend teens 13 and older for this film, and was surprised that both my teen daughters really enjoyed the sweetness (and again - unexpected humor) of this movie, too.